1 / Marc Jacobs lipglosses: Ultra-high-shine lip lacquers?? Yes, and yes. With multiple shades available in this holiday kit, any ultimate beauty guru would be hard pressed to say she’s not through the roof with this shiny set. 2 / Prism palette: Okay, there’s a chance she might have this already, but if she hasn’t shared 14 different makeup looks with it yet, you may be in luck. This eyeshadow palette is a must have this holiday season, complete with everyday wearable shades to jewel tones perfect for the holiday party smokey eye. 3 / Perfume sampler: I used to work in the fragrance department to help people pick out the best scents for themselves and for loved ones. Whenever they got stumped, I’d pull out this little wonder. It’s the perfect gift – you gift this to your recipient, and they have several little vials of popular fragrances to try over time, and a booklet explaining the notes and inspiration for each. This way, your beauty maven bff can test the fragrance with her chemistry, see how it wears over time, and pick out her favorite. All she has to do is bring the voucher inside the box to her local Sephora to pick out the fragrance she loved most. Done! 4 / Setting spray: It is highly unlikely that she’ll head out of the house without setting her makeup first. After all, why would you do all that work just for your makeup masterpiece to melt off your face three hours later? Trust me, she’ll use up Urban Decay’s All-Nighter – it’ll keep her makeup in place all day (and all night) long. 5 / Makeup bag: No doubt she travels with *at least* 10 lipsticks at any given time! Get her a dedicated makeup bag, like this one from Sephora! Fun fact, my makeup teacher designed these cute makeup bags with fun makeup sayings! Show her some love and gift a friend with this ultra roomy canvas makeup bag this season! Like these ideas? 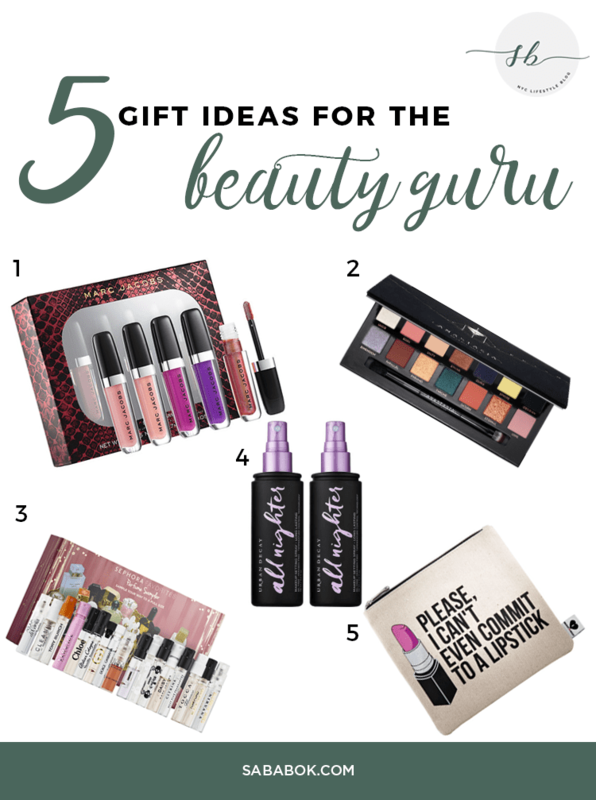 I hope this helped you choose a gift for the beauty maven in your life!